Since the perceived pitch of a note consists of the sum of its fundamental plus its harmonics, a distortion that adds extra harmonics will shift the pitch of that note up slightly. Likewise, a distortion that results in the rolling-off of higher frequencies (thus reducing the amplitude of some harmonics) can lower the perceived pitch. At the risk of offending, this is entirely wrong. Yes, most distortion adds harmonics. Indeed it adds harmonics not only to the fundamental (thus boosting some of the natural harmonics of the instrument so effected), but adds harmonics to the natural harmonics already on the recording. But harmonic distortion does not change the perceived pitch of the sound. The sound of an instrument is determined by a number of different characteristics: its level, its pitch, its attack and decay and its timbre. For the most part (very deep bass sometimes excluded), the pitch is determined by the fundamental frequency of the sound. Distortion does not alter this. The character of the sound is determined primarily by attack, decay and timbre. Ignore the first two and consider a sustained note. A violin plays a note. A flute plays the same note. The fundamental frequency is the same for both. But the timbre is different, and that is why they sound different. Timbre is the determined by the proportion of harmonic components (and, in some instruments, non-harmonic components) in the note. Harmonic distortion changes the balance of these harmonic components. If harmonic distortion changed the perceived pitch, it would be impossible to play a flute and violin in tune with each other. Listening to the tune is a very useful technique for evaluating equipment, but for a different reason than that stated here. On low quality equipment, the tune can get lost in the muck. While harmonic distortion is a problem (at significant levels, particularly with odd-order harmonics, it can sound very harsh and make a violin sound less like it ought to thanks to the timbral changes), one of the most important factors distinguishing good from poor gear is spurious noise. This can come from ringing in speaker drivers, or simply lack of control so that they continue to produce sound after they are supposed to have stopped. If you listen not to the main tune in a piece of music, which is normally delivered at a fairly high level, but to one of the sub-themes playing along at the same time, you ought to be able to follow it. Unless, that is, the system is producing muck that obscures it. Wrong! No doubt they've been confused by the fact that this display will accept high definition input signals. But what it actually shows is a low definition picture. Like many of the less expensive panels, it was designed for the US and Japanese markets which use NTSC. This has a vertical resolution of 480 lines. But here in Australia (and in Europe and India) we use PAL which uses 576 lines. So a panel like this actually reduces broadcast TV resolution. Panels with a vertical resolution of 720 or 768 pixels can probably get away with the hi-def tag, but not one with just 480 pixels. Gee I love overnight flights, followed by a local flight that finally gets me home just a bit before lunch. Plane out of Tokyo was chockablock, so not much room for stretching there. Our first day in Tokyo was largely spent at CEATEC (Combined Exhibition of Advanced Technologies). A massive display it was, but perhaps only a quarter of it was devoted to home entertainment technology. The rest: communications and components. There were big stands by Panasonic, Sony, Sharp, Sanyo, Hitachi, JVC and Pioneer. The only non-Japanese home entertainment company stand was a smallish one for Bose. There were also three stands devoted to DVD recording technology: one for DVD-RAM, one for DVD+RW/R and one for DVD-RW/R. 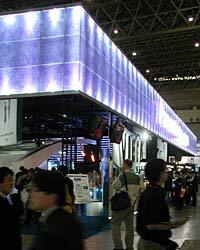 There were also stands for SD (Secure Digital flash memory cards) and Japan's numerous high definition broadcasters. Noticably absent were other strong Japanese brands like Yamaha, Marantz, Denon and Onkyo. NEC was there, but more in an info-tech than home entertainment capacity. Most of the major brands were focusing on panel displays: plasma and LCD. Most had a Blu-ray player with high definition stuff playing. Most had a 3-D display of some kind. Panasonic's version used a fairly large screen, rear projection, right-angled polarisation of the light from the two projectors showing the slightly different angles, and polarised eyewear for viewing. It actually looked very good. Rather than really flashy stuff, Panasonic used a recent baseball game for the demonstration. The others used small LCD panels that required no eyewear to work. These appeared to work by using an overlay that allowed only the appropriate portion of the image to seen by each eye. These tended to produce a rippling effect if you moved sideways while watching, which was absent in Panasonic's effort. Both, though, had a reasonably restricted viewing angle. My product pick of the show? Read the entry above.